I finally got around to the Advanced Condition feature in MadCap Flare. I’m not sure why, but I was expecting this to be a lot more complicated than it turned out to be. To give a quick overview, the basic method uses the top half of the user interface. You simply click “Include” and “Exclude” check boxes. The Advanced method uses the bottom portion of the user interface, and you have to create/edit the condition expression used to filter your conditioned content. If you love writing expression statements, you can start from scratch here; if you’d rather just have to change the tokens controlling your “include” and “exclude” operations, I’d recommend starting with the basic mode, and once you have it set with your conditions and what you want included and excluded, switch to Advanced. You then end up with an expression statement for each condition, and you can simply change the tokens as needed. NOTE: You can type the names of the condition tags as well as any of the following tokens: OR, AND, NOT, ( ). For example, let’s say you have two output conditions: help and print. 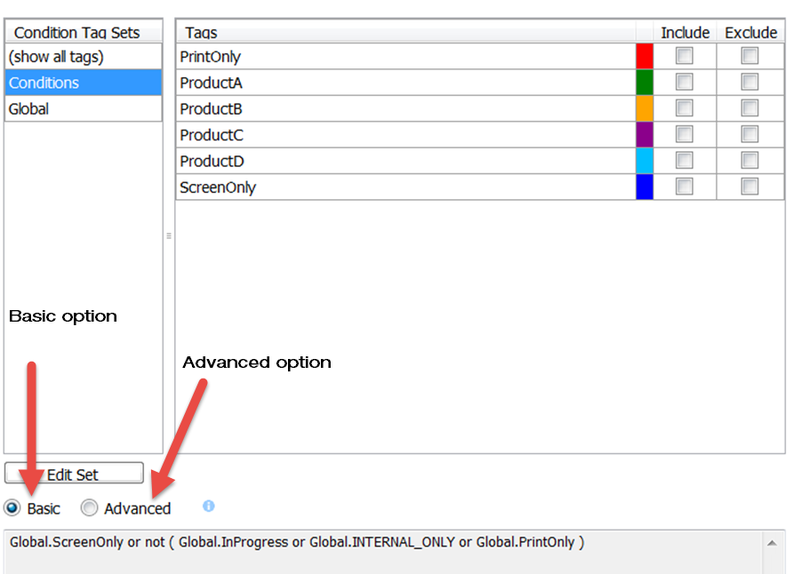 You also have four product conditions: A, B, C,and D. When working in the basic mode, an “Include” tag overrides an “Exclude” tag. So, if I have content tagged for product “A” and “help,” when I run my target to generate help for product B and I set my target conditions to include “help” but exclude “A,” this content tagged with both the “A” and “Help” tags will be included. To fix this, if you look at your conditions in the Advanced mode in Flare, you’ll see the reason for this is Flare’s “Basic” condition settings use the “OR” token. To make the above scenario work, we’ll need to change to the “AND” token. This is just a simple example of what you can do with the Advanced condition feature, but it should give you a good idea if this option will fix any condition filtering issues you are having.